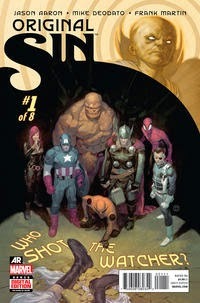 Marvel's Original Sin #1 led the market in a month that included a Spider-Man movie release and what Diamond Comic Distributors reported was its best Free Comic Book Day yet. That's according to Diamond's just-released report on what comics shops in North America ordered in the month of May. Retailers purchased a little over $43 million in comic books in May, down 4.52%; periodical sales were down only 2%. It was a four-week month versus a five-week month last year, so that performance is not bad, if unremarkable. The slate of new titles was much lighter than we've seen in a while: 427 new comic books came out, down 54 from April. It's the lowest number of new comic releases in six months. Again, May included Free Comic Book Day, and Diamond announced at its May seminar and on Twitter that its retailers had overwhelmingly reported in a survey that day was their best sales day ever. The problem is that it's difficult to put a dollar figure to such a statement — and also we do not know how long the retailers surveyed have been operating. The single best sales day in all of comic shop history in dollar terms is almost certainly the day that the "Death of Superman" issue, Superman Vol. 2 #75, was released in November 1992: reports at the time were of a $30 million day that day, more than $50 million when adjusted for inflation. There were more than double the number of comic shops then than exist now. A $30 million day today would require more than $10,000 in sales per location ($17,000 inflation-adjusted). 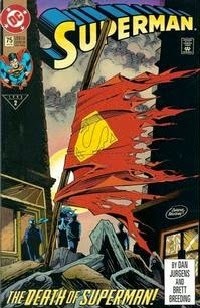 Since all the new product retailers ordered in the entire month amounted to $43 million, odds are the "Death of Superman" day still holds the crown — but Diamond probably on the mark that it's the best Free Comic Book Day, given its finding that retailers said sales were up 38% over last year's event. A quick note: The FAQ section of the site has, at long last, been updated with some information about how to interpret the monthly sales reports. More to come in the future. The final estimates for May should be out early next week. In the meantime, you can find your local comic shop here. John Jackson Miller has tracked the comics industry for more than 20 years, including a decade editing the industry's retail trade magazine; he is the author of several guides to comics, as well as more than a hundred comic books for various franchises. He is the author of the New York Times bestseller Star Wars: Kenobi and the upcoming hardcover Star Wars: A New Dawn. Visit his fiction site at http://www.farawaypress.com. And be sure to follow Comichron on Twitter and Facebook!